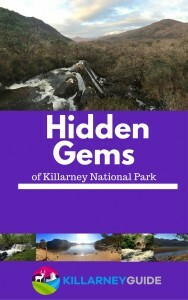 Killarney’s famed beauty has been attracting visitors for centuries and the scenic splendour of Killarney National Park continues to draw people in their thousands each year. Evening entertainment in Killarney town has also evolved over the years. After a refreshing day in the open air enjoying the sights, it’s nice to relax and unwind as the evening draws in. The Celtic Steps show has established itself as a firm favourite in the entertainment options available in Killarney. It is is a wonderful showcase of traditional Irish music, song and dance that is a great way to round off a day in Killarney. My first experience of Celtic Steps was last summer on a beautiful sunny evening. A ‘milestone’ birthday was being marked so dinner and a show was the plan. We strolled down Ross Road in Killarney as we digested the early bird meal we had just had in town. The last of the day’s sun was fading behind the mountains framing the Killarney Racecourse. We were looking forward to a good evening’s entertainment and we weren’t to be disappointed. Celtic Steps is a great showcase of the best of traditional Irish music, song and dance and is a lovely way to spend an evening in Killarney. Celtic Steps is located in the Killarney Racecourse on Ross Road, Killarney on the verge of Killarney National Park. The Racecourse is home to Killarney’s horse racing festivals and also hosts the Ross Golf course. It is less than 1 km from Killarney town and boasts one of the most scenic backdrops of a racecourse you are likely to see. Ross Castle and the wonderful trails of Ross Island are a further 1km along Ross Road. The venue is a pleasant walk, cycle or taxi from the town and there is ample car parking in the Killarney Racecourse if you are travelling by car. The venue is a lovely intimate space with tiered seating to ensure everyone gets a good view. The show consists of two halves of about 45 minutes each, divided by a short interval of 15 minutes. Those 90 minutes are packed with a variety of entertainment that makes the 45 minutes fly by. Throughout the show, a full 5 piece band is present with some breaks for solo performances. The energy of the dancers emits from the stage and can be felt throughout the intimate venue. Not to be outdone, the wonderful singing will leave you haunted and uplifted in equal measure. One of the nice things about Celtic Steps is the authentic feel to it. The post-Riverdance phenomenon brought lots of shows that dwelt on mythology and mysticism. Celtic Steps focuses more on the art of music, song and dance while respecting the traditional heritage. Those on stage are are multi-award winning performers and their talent and experience is evident throughout the show. Now in its fifth year, Celtic Steps is an established show that has become a firm favourite with visitors and locals alike. It’s not hard to see why. The show gives a wonderful taste of each of the pillars of traditional Irish music, song and dance. It is delivered in a well-paced and tightly structured format that ensures you will leave with a memorable experience. There is no shortage of evening entertainment on offer in Killarney. During the summer months, you will be spoiled for choice at the various venues around the town. Celtic Steps is a great choice for those who want to see, hear and feel what traditional Irish music, song and dance is all about. We certainly felt it on this particular evening as we filed out of the venue after the conclusion of the show. We could just about make out the silhouette of the McGillycuddy Reeks in the distance as we emerged into the car park. An ideal setting for an experience to remember. Tickets for Celtic Steps are available online at celticsteps.ie or at the Celtic Steps Box Office or Killarney Tourist office. Advance booking is recommended. Great show! Very nice songs! And the champion of riverdance : amazing! thanks for the comment, glad you enjoyed the show!